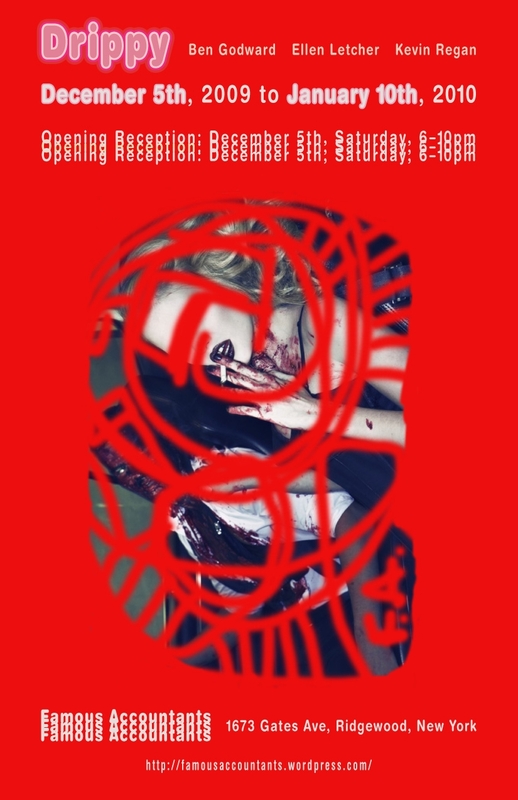 Famous Accountants Art Gallery is pleased to announce the opening reception for its second exhibition: Drippy on Saturday, December 5th from 6-10pm. Drippy is a collaborative installation created by Ben Godward, Ellen Letcher and Kevin Regan. It was conceived by Letcher and Regan in a hypnagogic haze. The installation is comprised of blood-like drips on the walls of the gallery and site-specific floor sculptures by Godward. Ben Godward employs plastic, rubber, found objects and urethane foam to create large, multi-colored combinations of gesture and form. On the surface, his sculptures resemble colorful abstract expressionistic paintings, but a closer look will reveal underlying themes of pop culture, ravenous consumption, even a suggestion of toxic waste. Godward exploits the viewers attraction to shiny, candy-colored objects, while simultaneously repulsing us with the endless cast-offs of our society. Ellen Letcher. Repurposed content: ripped and regrouped, then reread in an altered state; to create accessible images via rich new media but not excluding actual paint and reproduced print. Kevin Regan is an artist who lives and works in Brooklyn. The computer as both a tool and metaphor informs much of his art. Loops are a recurring figure in his work. He’s very intrigued by the massive surplus of information in our time. Please join us on December 5th for art, artists, cookies and drinks! « Closing Reception for Twenty-Three: This Sunday, Nov. 22!